Since EuroMaidan, Ukraine has had the good fortune to have attracted the attention of international multilateral organizations with more focused and practical opportunities for collaboration with our country to help us transition to democracy. Sometimes even there is a rare occasion when a true meeting of minds happens; the stakeholders share not only knowledge, experience and history for the place, but an uncommon language and exceptional vocabulary for the longitude and latitude of the landscape, one not understood by many. An educated but also intimate perspective on what Ukraine still faces to fully transition to a democracy. Indeed, the disarming ability to quickly neutralize Russian interference in the process of a conversation is shorthand for our simpatico and shared values. One such occasion took place as part of an ambitious tour of Ukraine organized by the Organization for Security and Co-operation in Europe (OSCE). A delegation of distinguished colleagues headed by Special Representative of the OSCE Chairmanship-in-Office on Gender Issues Ambassador Melanne Verveer visited Kharkiv on June 16. We had the pleasure of joining the ambassador as part of a meeting of local actors in civil society to discuss broad strokes in gender issues facing Ukraine. We found a common thread in the importance of role models for women in Ukraine, success stories and most importantly the unique and oftentimes greatly misunderstood aspects of gender, and specifically gender stereotypes, in Ukraine. 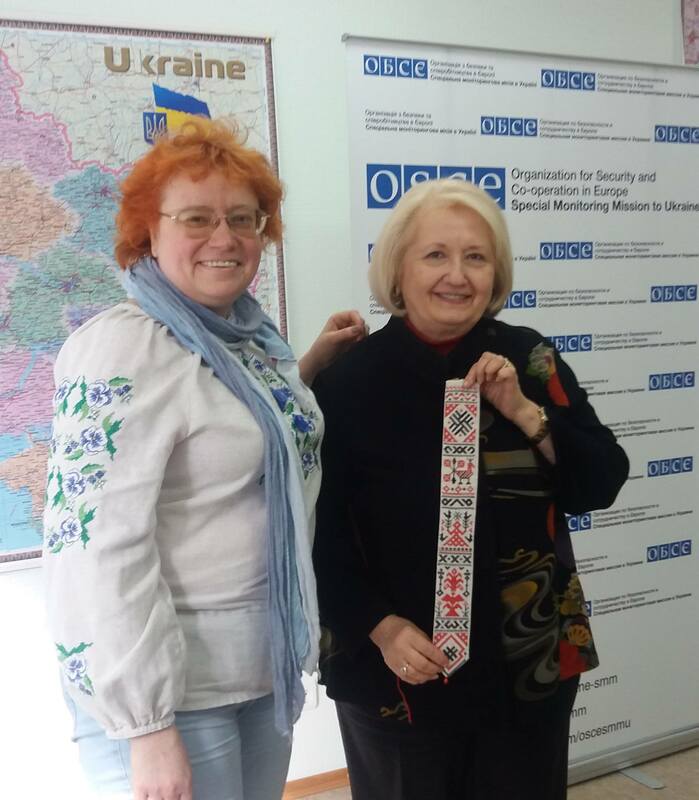 As director of Maidan Monitoring and Information Center, its social intermediary programs and the Ukrainian Peacebuilding School, a lifelong community organizer and activist, and a woman entrepreneur in the technology industry, I was able to quickly find the common language with Ambassador Verveer around problems specific to Ukraine necessary to impose OSCE’s potential impact in the country through practical solutions. Quite remarkably, we even identified gaps in service which if filled could bring much success to broad and specific issues around gender equality in Ukraine. There is much attention needed to address the past, present and future of the Russian Federation’s efforts in weaponizing gender, in respect to the roles of both women and men in gender equality in Ukraine. Fertile ground can be found in leadership roles in politics, women as role models, in general, and better positioning women in the technology and sciences industries and the Ukrainian military. The Organization for Security and Cooperation in Europe has the only long-term international monitoring mission on the ground. Its reports, along with those of others who have visited the conflict area, signal possible war crimes and atrocities, torture, sexual violence, human trafficking and other crimes that must be investigated and ultimately prosecuted. Additional gender focused activities would offer a powerful incentive to help Ukraine expedite its attempts to weed out corruption and dismantle the monopolistic relics of its Soviet period and continued Russian hybrid warfare and information operations specific to gender. Once again, the weaponization of gender. It was particularly special to engage with Ukrainian diaspora. Melanne Verveer, an American of Ukrainian descent, was part, for some time, of the administration of President Bill Clinton. She was an aide at first to First Lady Hillary Clinton, eventually becoming her chief-of-staff. During her years there, she contributed greatly to the promotion of US-Ukrainian relations. Like our communication officer, Mykola Molodyko, Melanne Verveer’s grandfathers and grandmothers on both sides came to America at the beginning of the past century. They settled in Pennsylvania, where they worked hard, but still raised their children and grandchildren in a Ukrainian spirit. 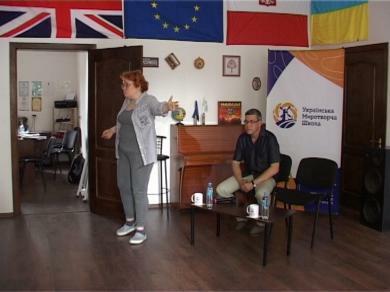 A strong connection exists with Ukraine and the families of the “first wave” of immigrants. We had a lovely time with the ambassador and the OSCE delegation and were happy to have shared our experience around our extensive peace building, dialog facilitation and mediation work. In a very brief period we climbed some pretty tall peaks and discussed gender specific strategy, social norms and Russia’s heinous “family values” information operations campaign and its similarity to fundamentalist Islam. For example, how the oppression of women is transmitted to their children and they literally take out their frustration on their kids. It is invaluable to have an exchange ideas with those on the same playing field and to have explored cross-cutting themes of advancing technology for greatest impact and “returning” to European values, now that Ukraine is back at home in Europe. Moreover, the importance of having a distinct vocabulary and an intimate language for positive dialog is imperative to a most meaningful experience. Quite special. Nataliya Zubar, Maidan Monitoring Information Center, Chair. Mykola Molodyko, Maidan Monitoring Information Center, Communication Officer.